Nobody said dog ownership was ever going to be an easy task, so, here we break down how to choose the best dog food and more. From housebreaking your dog to teaching them how to behave on a leash, it can be a lot of work. In the end, it is all rewarding, but sometimes we overlook some of the most important factors in dog ownership. Chief among these is often the selection of dog food for our four-legged pals. Americans are increasingly focusing on the content of their own food, but far too few or paying the same attention to the food their beloved dog enjoys. Ideally, all dog food should be created equally. In reality however, numerous dry- and wet-food brands aren’t necessarily a good choice for your pet. In this post, we’ll give you a few helpful tips to choose the right food for your dog. 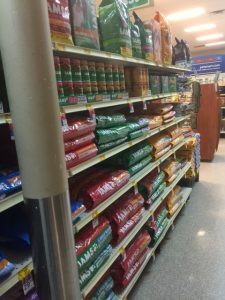 In your search for the right dog food, you’re going to come across countless brands and types of dog food. Each one will have its own unique labeling, and some of those will be confusing. This is often the step that trips up most owners, so we’ll devote the biggest chunk of this post to clearing up any confusion. Not all of these points need breaking down, but we are going to start at the top of the list. If you notice that the particular food you’re considering says “chicken,” than that item must make up a minimum of 70% of the entire product. Watch out for products that include “dinner,” “entrée,” or “platter” in the name. These are only required to have 10% of chicken. Terms such as “with chicken” and the addition of “flavor” mean only 3% chicken content for the former, and less than 3% for the latter. The list ingredients is the next point worthy of focus. An ingredient list doesn’t explicitly tell you the quality of the ingredients or where they came from, but instead just lists what different items are in the dog food. For example, corn and wheat are often included in dry dog foods. However, some manufacturers try to trick dog owners by breaking up corn into flaked corn, ground corn, and/or kibbled corn. This makes it appear as though less corn is in the food because it is lower down the ingredient list, but in reality it may make up more of the food content than meats and other healthier ingredients. Another term to watch for is the use of whole meats. Whole meats contain high water weights, and when broken down results in less meat after processing. Meat meal, which sounds worse, can actually be better because it contains more actual meat than whole meat because there is no water weight. Finally in this section, let’s look at nutritional adequacy. The Association of American Feed Control Officials has strict guidelines for backing up statements such as “complete and balanced diet” in food labeling. These diets must actually contain the minimum amount of nutrients necessary for a dog. The guaranteed analysis of this should clearly highlight the minimum amount of crude protein in the food, along with fat and the maximum amounts of water and crude fiber. All of these factors are critical in dog food selection, especially if your dog has specific dietary needs/restrictions. First and foremost, your dog’s individual physical characteristics and behavior should serve as a starting point when comparing foods. For example, puppies and lactating mothers need high-calorie diets to maintain their active lifestyle and nutritional needs. Conversely, senior dogs require fewer calories a day to keep their weight in check as their body ages. As another example, a highly active breed requires more calories to keep up with its lifestyle than a couch potato dog that isn’t as active. Compare the calorie content and feeding guidelines to ensure your dog gets the right amount of calories to match their lifestyle, and avoid obesity and the many problems it brings. When it comes to grain-free foods, make sure it is more of a necessity for your dog and not an individual choice for you as an owner. Grains are not harmful to dogs as a part of their dog food, but if you suspect your dog has an allergy to grains it is good to have your vet confirm that before making the jump to grain-free foods. In the end, buying grain-free foods without knowing your dog is allergic to grains might leave you paying more for food that isn’t making a difference in their health. Last, but certainly not least, do your homework. There is a wealth of information available online to help you research individual brands and their reputation. This post can help you narrow down the list of potential best foods for your dog, and from their you can use your own research on those brands to determine which one is best for your four-legged friend. Arthritis can be a painful condition for dogs and humans alike. Nobody wants to see their best friend, furry or otherwise have to live with pain. Arthritis is an acute or chronic inflammation of a joint or joints. There is no cure for most types of arthritis but there are several treatments that can ease the pain and improve quality of life. NSAIDs are a non-steroid that can help with inflammation. You can find these over the counter at just about any drug store. The most common type is aspirin. As with any medication it is always a good idea to discuss this with your veterinarian before you start giving it to your dog. This is important because dosage amounts will differ with dogs and most labels will have the correct dosage amounts for humans only. Steroids such as Prednisone, Dexamethasone, and Corticosteroids will need a prescription from your vet and help reduce swelling and inflammation. 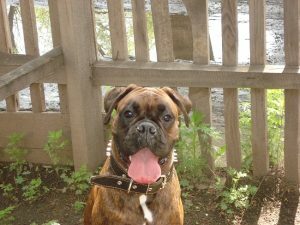 You should not leave your dog on steroids for any length of time as they will eventually wear down joints and make the problem worse in the long run but can be of great short term assistance. Glucosamine is the most common supplement recommended by veterinarians. It is a combination of a sugar and amino acids naturally found in several seafood species, most commonly shellfish such as shrimp, crab, and lobster. These fish oils help the body’s production of joint lubricants which helps take the tension off the joint and allows the cartilage to stay healthy. It works almost like the shock absorbers in your car. The less tension on the joint the longer cartilage will stay healthy and not wear down. Having your dog on a supplement with fish oils, omega 3, and omega 6 fatty acids before or as soon as you start noticing symptoms will help prolong your dog’s joint health. There are also a few things you can do to help your dog that are not related to medicine or supplements. One thing you can do is make sure your dog has padded bedding, the softer the better. After a period of sleep or rest joints can stiffen up and be even more painful. There are several companies that sell beds specifically made for dogs with arthritis. This may not be necessary as you can use pillows and other household items to help ensure your dog is more comfortable. Ramps are a great idea as well. If you like having your buddy up on the couch or bed with you the jump may be too tough for them. You can buy or make a ramp yourself that will help the dog get to his favorite places. Massages can help blood flow to their muscles. When you are petting your dog you can easily turn it into a massage by gently kneading their sore muscles. The worse your dog’s arthritis gets the less they should exercise. Gentle exercise can help them stay healthy but you should make sure it is at their own pace and not over exerting themselves. Too much exercise will hurt the dog but a slow and short walk can help keep their muscles and joints loose. If your dog gets no exercise his muscles will atrophy more and the dog will lose mobility faster. Make sure you are not pushing the dog too hard but short walk will certainly help. Warm ups. A short one or two minute walk will help your dog loosen up and get the blood flowing. As with people you should always warm up before exercising, the same goes with your dog. Low impact exercises are the best. If you have a dog that loves water you are in luck. Possibly the best low impact exercise is swimming. Sometimes it may be hard to tell how tired your dog is getting so you should either swim next to the dog or get a doggy life jacket in case your pooch gets too far out and cannot make it back. Your dog may not be able to use items such as a flirt pole or spring pole anymore, but some light tug of war and playing will suffice. If you are walking or playing and you see the dog hurting or whimpering it is time to pack it up and let them rest. Cooling down is just as important as warming up. You do not want your dog to go from exerting themselves to laying down. A slow cool down walk after exercise and before rest will help keep the muscles, tendons and ligaments loose and limber. If your dog goes from working out straight to sleeping when they wake up soreness and stiffness will be much worse. Unfortunately once a joint is damaged there is nothing short of surgery that can completely reverse the issue. Proper exercise and using an all natural supplement such as Bully Max Total Health Powder that contains Fish oils and Omega fatty acids will help keep your old friend up and running with a higher quality of life. Steroids and NSAIDs will help treat the pain and can be used in conjunction with a natural supplement. If you start noticing stiffness and pain in joints you should take your dog to a vet right away and make sure you know the root cause. Arthritis is common in dogs but is not the only reason a dog might be showing symptoms. For example Lyme disease is another common issue that can cause stiffness in joints and if that is the issue antibiotics prescribed by your vet is the best treatment.